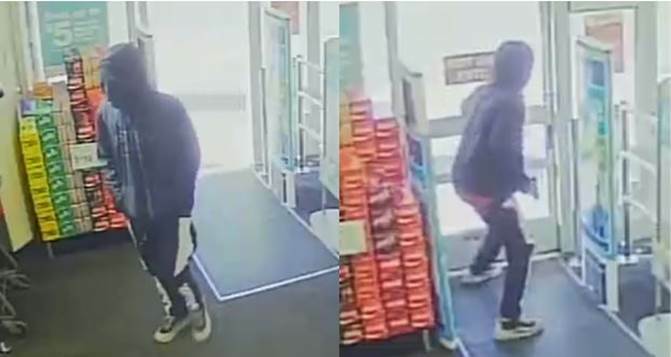 On February 2, 2019 at approximately 10:15 AM, Kingsport Police Patrol Officers and Detectives responded to a report of an armed robbery at Walgreens, located at 1420 West Stone Drive in Kingsport. The ensuing investigation by the K.P.D. Criminal Investigations Division revealed that a lone unidentified suspect, presumed to be male, wearing all dark clothing to include a mask, hood, and gloves, entered the business and proceeded to the pharmacy area of the store. The suspect jumped over the counter, produced a firearm, and demanded a specific type of drug at gunpoint. The suspect fled the scene shortly thereafter with an undisclosed type and quantity of prescription medication. He was last seen running northbound on the adjacent Fairview Avenue and is believed to have possibly gotten into a white Honda driven by a second unidentified individual. No Walgreens personnel, customers, or bystanders were injured during the robbery. The incident was captured on store surveillance video, with photos of the suspect taken from that footage included in this release. Anyone who recognizes him, or who may have any additional information which may help solve this case, is asked to please contact the K.P.D. Criminal Investigations Division at 423-229-9429 or call Kingsport Central Dispatch at 423-246-9111. Additionally, anyone who witnessed the incident who has not yet spoken to Detectives is asked to please come forward by calling either of the aforementioned numbers. This incident remains under active investigation by the K.P.D. Criminal Investigations Division. As such, no additional information can or will be released at this time.